The High Veg Organics Co-op Ltd project belongs to a group of five members (two males and three females) as beneficiaries. This is a two hectare vegetable farming project with seven tunnels located in Robertson (Cape Winelands District Municipality). The project has been farming with basil, mint, wild rocket, parsley, coriander and their hydroponic tunnels. The director of High Veg Organics Co-op Ltd project is a 49 year old lady, Elizabeth Kleynhans, who is married with four children. 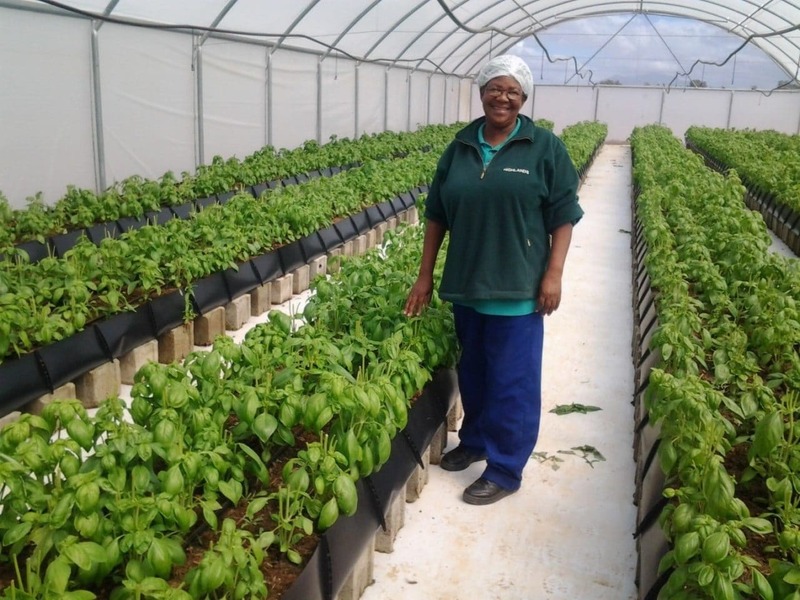 She has 16 years’ farming experience and works for the farm owner in Robertson, who agreed to lease this two hectare to them as an empowerment project. Kleynhans and her group of beneficiaries received financial assistance from the Western Cape Department of Agriculture’s Comprehensive Agricultural Support Programme. Casidra constructed hydroponic tunnels equipped with an irrigation system and accessories. They were further assisted with the set-up of their office equipment as well as procurement of the production inputs, to ensure the smooth operation of the farm. Currently, High Veg Organics produces herbs and has secured reliable markets for their produce. After harvesting herbs, they package them and store them in a refrigerated unit on the farm. The project supplies to a commercial farmer in Franschhoek. In future, this successful project intends to supply directly the retail fruit and vegetable markets. According to Kleynhans, their project created four permanent jobs and they intend on increasing the number. They are currently in the process of applying for more financial assistance in order to increase their profit margin. She said, “At the present moment we are doing well with the produce from seven tunnels. However, we will be happy if we can get an additional 15 tunnels to produce more products”. We are very grateful and appreciate the support received from the WCDoA and Casidra. However, we want to be highly sustainable and work independently like commercial farmers. We would like to assure all the potential funders that we are going to do our best to make a great success story of this project”, she concluded.